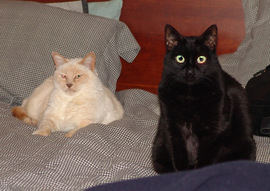 The Thompson and St Lawrence cats have moved into a new phase of their enforced relationship, with accompanying changes in behavior on the part of certain cats. Here are the visiting St Lawrence cats, Buffy and Sherman. The cats seem to tolerate each other’s presence for longer periods of time without angry flareups. 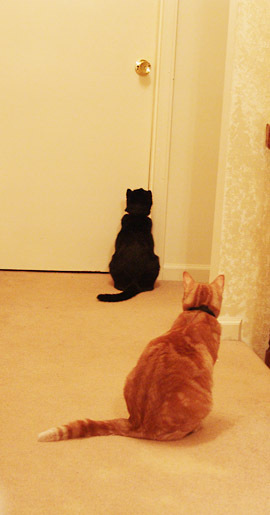 This morning, for instance, the cats are having a meeting while Gretchen and I join Doug Thompson in the Internet Room. Gretchen is surfing while Doug and I blog and at least four cats are having an animated discussion about turf and pecking order. Dr Jeckyll, Doug’s large orange tabby, is the most vocal of the group. Although he is the No 2 cat in the Thompson household, he has taken the lead in inter-family negotiations. He spends much of his day performing for Buffy, who is the St Lawrence version of Zsa Zsa Gabor. Buffy is also a little plump, but strikingly beautiful with the right lighting. Buffy sits, serenely confident of her beauty, and observes Jeckyll dispassionately until he bores her, at which point she yawns and resumes her grooming. If he tries to invade her space, she hisses explosively which makes him retreat to the doorway where he flexes his muscles and croons engagingly. Antichrist, the top cat in the Thompson household, watches from a distance while Jekyll struts his stuff. He occasionally expresses an interest in the new cats, but prefers to concentrate his charm on the St Lawrences themselves, figuring quite correctly that this will provide a better pay off in food and attention. I am beginning to see that Antichrist’s position at the top of the household pecking order is based not only on brute strength, but on cunning. He is a most engaging rascal and will charm food right off the dinner table if not watched closely. Sherman, our black Abysinnian mix, has calmed down remarkably now that he realizes that neither the Thompsons or their cats are going to eat him. His uncontrollable fear of strangers seems to have faded away and has been replaced with a new sense of adventure. He has learned to sit calmly with a bored expression while Jeckyll bellows and moans at him. At the same time, he seems to be more aware of his dependence on Gretchen and me because he interacts with us constantly whenever we are in the room with him. In short, the cats are achieving an uneasy truce amongst themselves and are using every opportunity to charm the visiting humans and get extra privileges and food. This follows closely the behavior of companies which have been merged. The employees mark their time and strive to see which way the wind is blowing by cultivating friendships in the ranks of top management. When we separate these cats and move to our new home in the near future, our cats and the Thompson cats will probably miss the excitement that this visit has afforded them. This final shot shows Buffy’s fans waiting for her to appear.